You swim. You bike. You run. You obsess over data and details. So do we. And we�ve just perfected your new training partner. 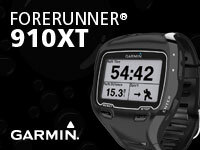 Forerunner 910XT is the only all-in-one, GPS-enabled device that provides detailed swim metrics and tracks distance, pace, elevation and heart rate� for running and cycling. It sports a sleek profile, comfy wristband and an easy-to-read display. 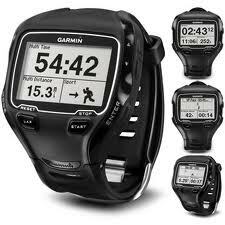 Designed for open water and pool swimming, Forerunner 910XT is water resistant to 50 m (164 ft). It�s our first multisport watch to offer extensive swim metrics, including swim distance, stroke identification, stroke count and pool lengths. It also computes your swolf score to help you gauge your swimming efficiency. The 910XT�s robust design and easy operations make it suited for other water sports, including paddle boarding. Because it�s GPS-enabled, Forerunner 910XT even captures the path you traveled so you can view it later on a map in our free online community, Garmin Connect�. This feature can help you analyze your open water swimming and adjust your technique as needed.